For some years now the financial crisis has forced governments, NGO’s and people to cut their budgets for the Third World and Development Aid. That is a fact of life. We from AAWS started in 2011 with the setup of a new funding system based on this new reality. Systems that do not need cash coming from Western Donors but one that obtains funding from the place were funding is needed. We started the ‘Bali Watershop Project’ in which activities are generated for two different target groups: tourists and BoP Indonesians. 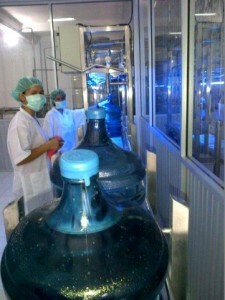 First cash is generated through bottling of Premium water. This premium water is sold to rich tourists on Bali. The revenues are then invested in the set-up of water shops for the BoP . So called ‘Toko Air’s. The Toko Air’s will be run as franchise shops and are operated by local entrepreneurs. At present the first Toko Air is open now as you can see on the picture above. If you are interested in more information on this project please let us know. We will keep you posted on the developments from here.